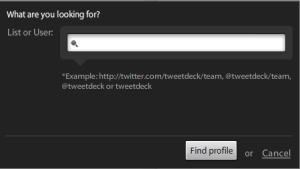 TweetDeck is a desktop application for Twitter. Like other Twitter applications it interfaces with the Twitter API to allow users to send, receive, search and schedule tweets as well as view other users' Twitter profiles. TweetDeck is also available as an App for iPhone, iPad, Android, PC and MAC. TweetDeck was recently purchased by Twitter themselves and is one of the best desktop/mobile twitter applications available at the moment. There are other applications such as “HootSuite” and “Brizzly” but they are not as simple to use as TweetDeck. You will be able to see this box at the top of your Tweetdeck account. Here you can write and post status updates as well as insert and shorten URL’s. Because a tweet is only 40 characters long, Tweetdeck will automatically shorten a link that is either typed directly into the status box or copied and pasted. The link is shortened above with our own URL shortener, but yours will automatically with “bit.ly”. When you post a tweet make sure you leave 23 characters for easy Retweeting, or 50-60 for Retweeting and comments. These options appear when you hover over the picture or “Avatar” of the person who you would like to respond to. “Direct Messaging” or DM is a private way of getting in touch with one of your followers. Please note however you must be following each other to send them a Direct Message. When you click on the “Other Options” tab you will be able to see more options to apply to that follower. So you can follow, unfollow, block and view profile of the individual who has just tweeted you. All this can be found under the “User” tab. 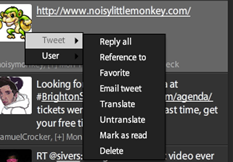 The other option tab “Tweet”will give you further options include translating a Tweet. You can schedule tweets to automatically tweet on a selected date and time of your choice. 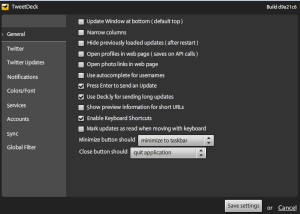 To do this click the little clock icon found in the top right hand side of the Tweetdeck control panel. Once you have clicked on the clock this menu will appear, where you will be able to set the time and the date of the tweet. The setup is fairly similar to that of Microsoft outlook where you simply just click on the date on the calendar and then use the 24hr style clock to set the time. 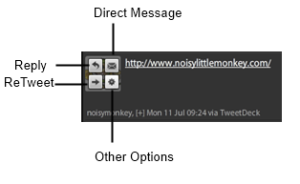 Organizing your TweetDeck control panel view allows you to have whatever column you like in the centre of your screen. So that could be your stream, or “@” messages, whatever you like! If you would rather have all your mentions in the centre of your screen just simply use the arrows to move the columns around to customize your own view. You can get 5 columns on Your TweetDeck account control panel if you choose narrow columns. Also note if you click on the new buttons to open new columns, you should close some of already opened ones in order to see new ones or just scroll from left to right. At the bottom of each of your columns you will see a small list of icons. Again most are self-explanatory.” Mark all as seen” and “clear seen updates” will remove all the tweets you have seen. This one is extremely useful because for example, if you are searching for links to Retweet you can type “http” and all messages with URL’s will be listed. Also “RT @” is useful, because you can filter messages, which the people you follow deemed to be worthy of ReTweeting. If you’re looking for questions to answer and help somebody just type question mark – “?” or “please” and you’ll get all questions or requests from the people you follow. You can also filter by username – select dropdown list and write a username and get only their tweets in one column. You can even select time frame which gives you complete control of your columns. “Clear All” which will clear all of the information from that column to make it clear for fresh information to appear in that column. “Mark all as seen” is useful as this allows you almost to tick off all the mentions or direct messages within a column, so when that column is updated automatically or refreshed you know which ones you have seen. “Show what is popular in this column” will instantly display what your followers are tweeting about, who is being tweeted at, or popular links that are being tweeted. The Tweetdeck settings tab can be found in the top right hand corner and is the “Spanner” Symbol. 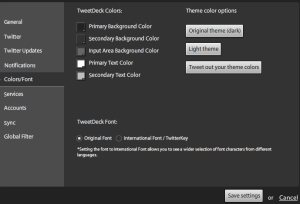 You can un-tick or select as many options as you like, including choosing your colour scheme for TweetDeck. All these tabs can be found in the top right hand side of you Tweetdeck account. 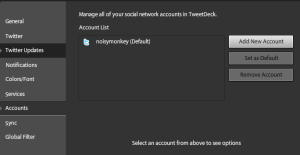 TweetDeck support once clicked will open another window offering lots of useful hints and tips. Single column view once clicked the TweetDeck view panel will then be reduced to the size of a single column on your desktop. 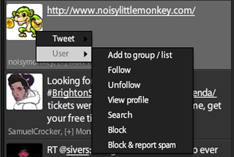 Just a neat way of reducing the size of TweetDeck quickly or if you have lots of windows open. Refresh once clicked will refresh all columns you are viewing. Attach Video/Photo allows you to browse your computer to upload a video or picture into your tweet. Twitter is an excellent way to monitor your brand and what is being said about your company on or offline. Engaging with your followers in good and bad times shows that you appreciate their thoughts and making sure you can turn a negative comment into a positive experience. In simple terms make good on whatever the person is unhappy with by showing that you care and you are willing to listen to them. With Twitter, you can track whenever your company or brand is mentioned in real time! 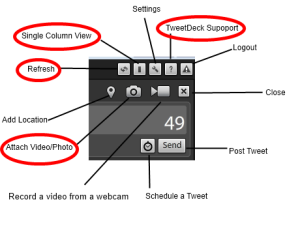 Tweetdeck can do all of this for you by allocating a whole column. You can track any keyword, phrase, mention, retweet or hashtag. In order to create a column purely for you to monitor your brand the first step to take is to add a column from the top left hand side of the tweet deck browser. One you have clicked the "Add Column", a box will appear that looks like this. "noisylittlemonkey" OR "nlm" OR "noisy little monkey" OR "mrjonpayne" OR "jon payne" OR "noisymonkey" OR "noisy monkey" OR "#monkeytalk"
Make sure you add the word “OR” in between each word not “AND” as if you add the word “AND” you will only see results if all the words are tweeted at the same time. Once you’ve added all the data you would like to monitor click on “Search”. The column will then be automatically created within your TweetDeck view. At any point you wish to add another word to monitor simply just go to the top of the column and click on “Edit” and then add the new word in. This also applies if you would like to stop monitoring a particular term just remove the word or phrase from the search bar. Once you have made the changes click on “Save” and all the changes will be saved. You will then instantly start seeing tweets appearing with your monitored keyword, phrase, mention, retweet or hashtags.